I admit, I only decided to make it because it looked so beautifully neat and pretty. But, now that I have tested it, the decision has been made. This tart is here to stay. The recipe was adapted from here, although a few changes were made. In a food processor, mix the flour, butter and salt until it resembles coarse sand, then add the vinegar and 1-2 tbsp of cold water, one at the time. when the dough comes together, wrap it up and put into a refrigerator for at least 30 minutes. Roll the dough to about 30 cm in diameter, 3 mm thick, wrap it up and return to the refrigerator. While the dough is chilling, cut the zucchini and sprinkle with 2 tsp salt and drain in a collinder for 30 minutes. Squeeze them gently and pat dry on a towel. Transfer the zucchini to a small bowl and sprinkle with olive oil and pepper. In another bowl mix the cheese with herbs, salt and pepper and spread over the dough, leaving 2 cm around the edge uncovered. 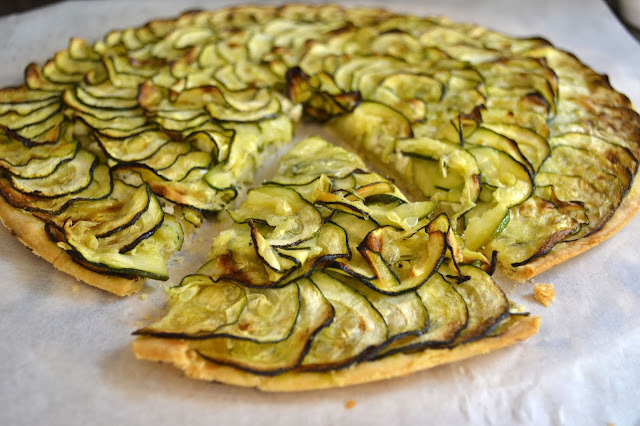 Now arrange the zucchini slices in tightly overlapping cicles all the way to the edge of the dough. Drizzle with another tbsp of olive oil and bake for 45-50 mins until the zucchini gets to a golden colour.